I often write about how we’re living in a time of escalating currency wars. The Swiss National Bank just used their counterweight trebuchet to launch a projectile into the currency markets as they announced that they will no longer peg their Swiss Franc to the Euro at a set rate. It’s not often you see a chart of the USD vs any other currency down 13% in an hour. Such is the case today with the US dollar vs the the Swiss Franc. This kind of sudden dislocation in major global currency exchanges present a major challenge to the status quo. It creates confusion and stock markets don’t like confusion. Remember that it’s not the direction of currency moves that matter as much as the speed and magnitude in which changes in those moves happen. And today, these intraday currency charts look more like weekly charts than the 1-hour charts they actually are. Net net, these currency dislocations are probably not bullish for stocks near-term tho it is bullish for gold near-term and long-term. I’ve always argued that a strong currency creates the most prosperity. Essentially, it’s for the good of the Swiss people to allow their currency to be strong and more valuable than the Euro/USD fiat currencies. That said, the Swiss National Bank also cut their interest rates to a -0.75% (yes, negative interest rates, meaning that you get 99.25 cents back after a year if you lend the Swiss government $1). Talk about punishing savers and retirees looking for safe yield. Anyway, my point is that Switzerland is continuing to play central-planning games and this currency move today is part of their own currency war strategy. The Euro just lost a major buyer as the Swiss will no longer buy Euro’s with Fracs to prop the Euro up and keep their own currency lower than where the markets think it should be. Scutify Chart(s) of the Day: Amazing how similar the 1 hour, 1 quarter and 1 Year charts of the US Dollar vs. the Swiss Franc are. No so for the 1-day chart tho. Anyway, this is all about the currency wars and these types of dislocations in a currency market are likely to have some huge ramifications for some companies’ earnings, for some of the large casino banks, for hedge funds and for economies at large. Governments of developed and developing countries have been manipulating their fiat currencies for my whole lifetime and I don’t expect it to stop any time soon. The entire Swiss GDP is about $650 billion, about equal to the market cap of Apple. So it’s not like the Swiss Franc is ever going to replace the US Dollar as the world’s reserve currency. Most currency war outcomes still favor the US Dollar for the next few years, and I still think after we get some temporary fear built into the stock markets from these currency dislocations, we’re likely right back into the Bubble Blowing Bull Market we’ve been successfully riding for the last five or six years. One last thought — all this analysis of government fiat currency wars underscores why some folks believe Bitcoin is a long-term game changer. 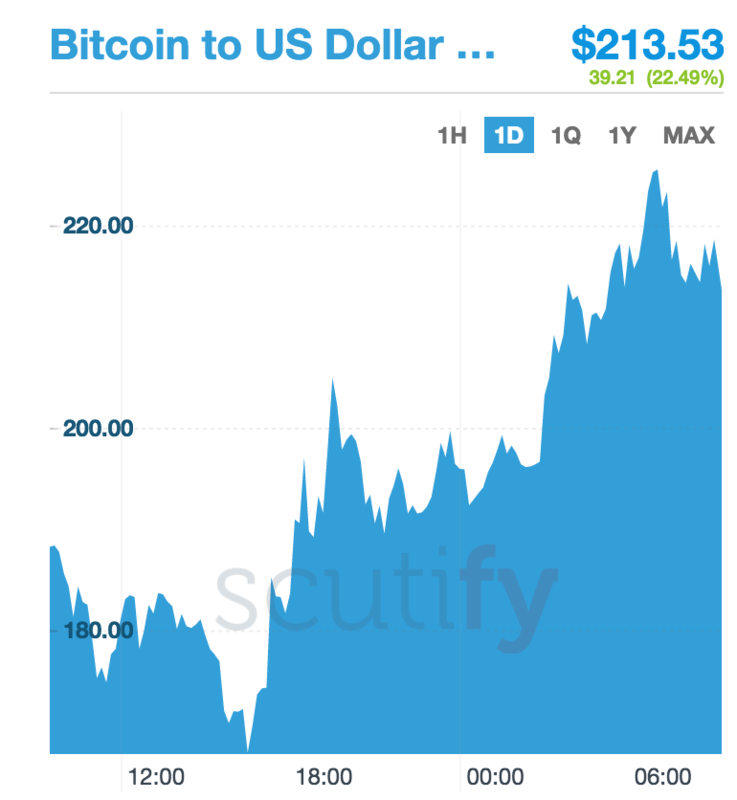 $BTC up 22% today, which is, well, just a little bit more than the Swiss Franc. All this once again underscores why we focus on finding companies that are truly revolutionizing industries and changing the world rather than trying to game un-game-able currency markets and government manipulations. Stocks on my list to buy next include: Synaptics, Intel and Whole Foods. You guys know that when I see the great pitches coming down the hatch, I’ll step up and get aggressive about building up my positions and trading both common stock and options. I just don’t see those pitches right now, especially with all the crazy currency, bonds, Treasuries and energy price action we’ve seen the last couple months. Keep the bat on your shoulder, but don’t force any swings.